The Adventures of Pinocchio, by Carlo Collodi, an Italian author from Florence, has been told in many different ways since it was first printed in book form in 1883. Though the story began, in 1881, as a series of children’s stories being printed for a newspaper in Rome, it has since been translated into several languages, and has become a play, television show, musical, and movie. Of these variations, none have been as well received world wide as the 1940 motion picture, animated feature, from Walt Disney Studios. Released to theaters by RKO Radio Pictures, this children’s story, now simply known as Pinocchio, became Walt Disney’s second full length animated film to receive an Academy Award. In fact, Pinocchio received two Oscar’s and was only Disney’s second attempt at a full length animation. It will be Disney’s version of this popular story that I will use to illustrate why it is important to consider the “cup of Christ” before giving into the “chalice” of hedonistic pleasure. To help Pinocchio along in his quest, the blue fairy appoints a cricket to be the puppet’s official conscience. The cricket, named Jiminy, is eager to oblige, but it doesn’t take long before Pinocchio is ignoring his friendly conscience and following a whole host of unsavory characters right into trouble. 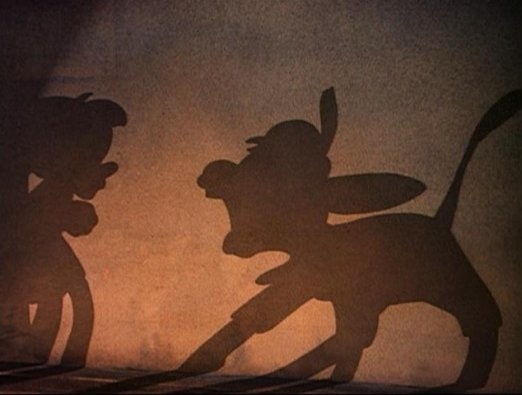 Two of the most dangerous, and reoccurring, tempters in Pinocchio’s life were the fox and the cat. Honest John (the fox) and Gideon (the cat) weren’t the most dangerous because they were the most evil and vengeful — No. The fox and the cat were most dangerous because, unlike the other characters, they had convinced Pinocchio that they were trust worthy friends. Strong confidants. Friends that only wanted to give Pinocchio the best advice and counsel that any one could give, and they were so good at their con that they were able to get the little marionette to ignore his appointed conscience, Jiminy. One of Honest John’s, and Gideon’s, most fiendish lies came about from a deal they had struck with a sinister Coachman, in a local tavern. The Coachman tells the fox, and the cat, about a side business of his. You see, the Coachman went about “collecting stupid little boys” and taking them to a place called Pleasure Island. The Coachman then offers Honest John, and Gideon, a cash reward for every boy they bring to him. Well, it’s not long before they set their target on Pinocchio, and trick him into a trip to Pleasure Island. So, what is so very bad about a place called Pleasure Island? Nothing at first. Pleasure Island was simply a place where little boys could enjoy a carnival-like atmosphere. It was a place where there were no adults to supervise, or discipline. A place where little boys were encouraged to enjoy all the pleasures that their little hearts could contend with. Even if it was something like gambling, smoking, getting drunk, fighting, or wanton destruction. What ever they wished to do, they could do. Sounds pretty incredible. Do what you wish — no “strings” attached. Well, no strings that they were able to see. It seems that once on the island, and once these little boys had partaken in their wanton hedonism, these little boys, including Pinocchio, would partake in a dastardly transformation. A transformation that would begin from within and continue until it had over taken them completely. You see, as these little boys began to behave like little proverbial “jackasses,” they actually — magically — transformed into real jackasses. Yes! Long ears, wiry, fur-covered skin, buckteeth, hooves — the works — and once transformed, they were sold either to work in the salt mines or as exhibits in the side shows, with the circus. How many of us can relate to this puppet’s plight? We want to do right by our Creator, but we constantly choose to listen to the Devil’s lies, rather than the Holy Spirit’s still, small voice of truth. We choose to allow our desire to be happy today — now — this instant to rule our every thought. We so want to be gratified, mentally and physically, that we forget about the needs of the spirit. We sacrifice the eternal for the temporal, and then awaken one day as slaves in Satan’s “salt mines” or “circus side shows.” We cry for help, but our plight is only heard by the physical world as nothing more than the brays of a jackass. Pleasure, in and of itself, is not the real issue. Pleasure, alone, didn’t trap Pinocchio and the other little boys. No, the real issue for us, Pinocchio, and the little boys in the story, is our lust for self gratification. Self gratification says, “You’ve worked hard for this money, and they didn’t pay you what you deserve. Go ahead and steal the money — you’ve earned it.” Self gratification will tell someone, “This person’s been flirting with you long enough. You know they like you, so go ahead and do with them what you wish. They’ll appreciate your having made the decision for them.” The gratification of one’s self always — ALWAYS, mind you — comes with a consequence to both others and yourself. Those consequences can never be avoided. When we live to please ourselves, without thought of others or the ramifications that will transpire, then we leave ourselves open to the sweet, yet dangerous, enticements of hedonistic pleasure. We like pleasure. We want to trust that pleasure is our friend, that it only wants what is best for our well being. But it’s only when pleasure is contained in the eternal truths of God’s Word, Jesus Christ, that it can be to our benefit. Pleasure, achieved by way of self gratification, is simply going to cause hurt, pain, and possibly even death. Sure, it may be sweet ambrosia at it’s climax, but you will come down from that peak and step into a valley of disappointment or even fall into a chasm of destruction. The dangers of pleasing one’s self is a lot like how Eskimos supposedly rid themselves of wolves. It’s said that Eskimos will create a “pop-cycle,” from frozen animal’s blood, and a large, sharp hunting knife. Once the blood has been frozen onto the knife’s blade, the handle of the knife is frozen into the ground. This leaves the savory, yet dangerous, treat exposed above the icy turf. Wolves, passing by, will smell the blood and begin to lick at the sumptuous goodie, never realizing the danger at it’s center. 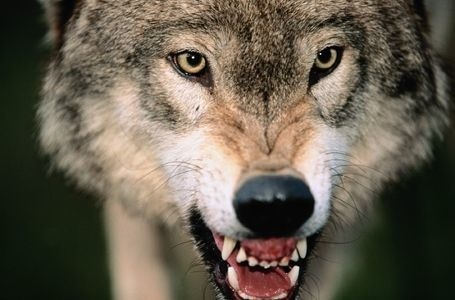 By the time a wolf’s tongue meets the sharp blade of the knife, its too numb to know that it is no longer licking the blood of some other animal — no — the blood it is now feverishly enjoying is the very blood from its own sliced and mangled mouth. The more the blood streams onto the blade the more excited the wolf gets until nothing remains but a severely maimed mouth and a very dead wolf. Satan uses physical pleasure much in this way. Each of us are hunted by him (1 Peter 5:8). The Devil watches us and learns of our enjoyments. Then Satan sets up a customized “pop-cycle” of deadly pleasures, just for us. We smell it, and look it over, but if we pursue the consumption of it, before listening to the council of God, we will certainly bear the pain of it. We may even die while trying to enjoy it. Pinocchio learned his lesson the hard way, but through a selfless act, and the kindness of the blue fairy, he was able to receive redemption and became the real boy he was purposed to be. You and I can’t sacrifice enough to receive redemption (Romans 6:23a), nor do we have a kind, blue fairy waiting to help us, but we do have a benevolent Creator, one Who became as one of us (John 1:1-18). Our Creator over came the temptations of Satan (Matthew 4:1-11). God, in human form, endured pain and suffering for us. God suffered and sacrificed Himself for our redemption (John 3:16-17). All we need do is believe in the LORD, Jesus Christ, and we too can become the true worshipers of God, we were purposed to be. In part two, of our study, we will look at several types of pleasure. 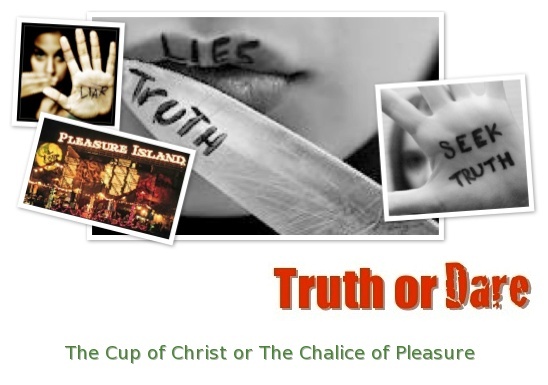 We will discuss both the good and the bad that revolves around sexual pleasure, in particular, and we will reveal what King Solomon discovered after he drank heavily from the chalice of pleasure. Truth or Dare by J. Scott Harden is licensed under a Creative Commons Attribution-NonCommercial-NoDerivs 3.0 Unported License. Permissions beyond the scope of this license may be available at http://www.jasonmin.wordpress.com. Pinocchio © 1940, 2009 Buena Vista and Buena Vista Home Entertainment, Inc. All rights reserved. This entry was posted in chalice, Christ, consequence, cup, devil, God, Pinocchio, pleasure, Satan, self gratification, uncategorized, Walt Disney and tagged chalice, Christ, consequence, cup, devil, God, John, Matthew, Pinocchio, pleasure, Romans, Satan, self gratification, uncategorized, Walt Disney by Jason Ministries. Bookmark the permalink.